What a weekend in Hannover, what a long distance! 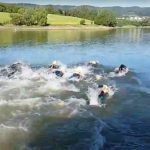 The names on the start list did not promise such excitement and the Quadrathlon Long Distance World Championships, set in the water park of Limmer Triathlon, will be remembered by many. It started on Sunday morning at 7:15 in good dry conditions, around 22 degrees during the day. Tomáš Svoboda (CZE) quickly took the lead in the nearly 4km swim and climbed out of the water in less than 50 minutes. The next chasers were Dennis Möller and Stefan Teichert (both GER) about 6 minutes behind. 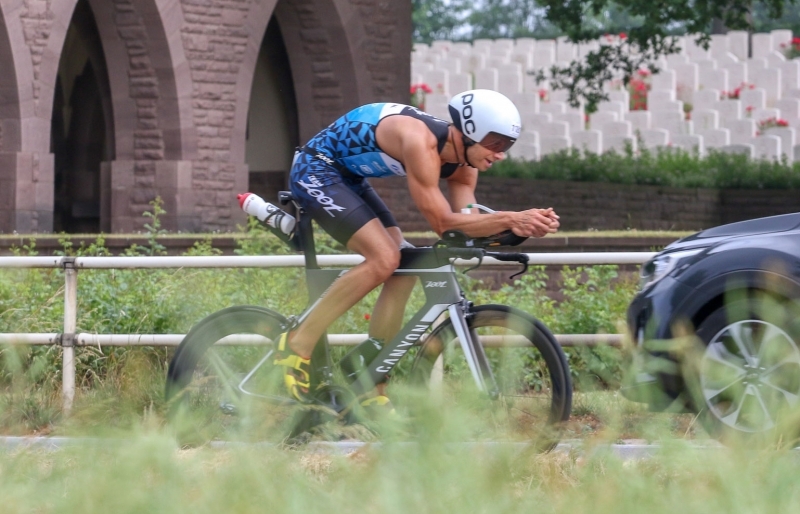 On the three bike laps over a total of 90km the two Germans applied the pressure on the Czech – after km 65 they made the catch and then went past. Leoš Roušavý (CZE) and Martin Flinta (SWE) also cycled very fast and tried to reduce their deficit from the swim. 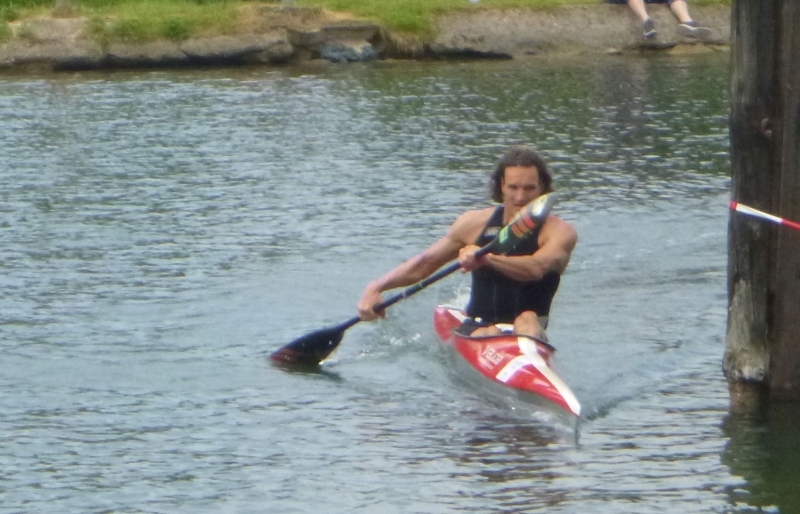 The spectators were able to follow the paddling closely over the 20km, spread over 9 laps. In his best discipline Möller quickly established a lead and developed this into an 11-minute advantage. 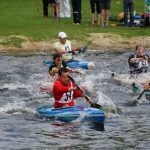 On many laps, there was always the possibility of a catching a wash – if you mastered it, like Ferenc Cisma (HUN), who paddled into second place with the fastest paddling time of all. 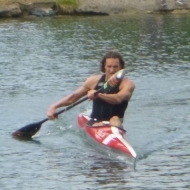 Also, Thoralf Berg (GER) improved his position with a fast paddle. As expected, Svoboda lost time in the kayak, but he a still got off the water in under 2 hours – for someone who only started paddling last year this was an extremely good performance. The decisive moments then came in the final 20km run, which Svoboda ran in 1hr 20, passing Möller on the second of two laps to secure his first world title. 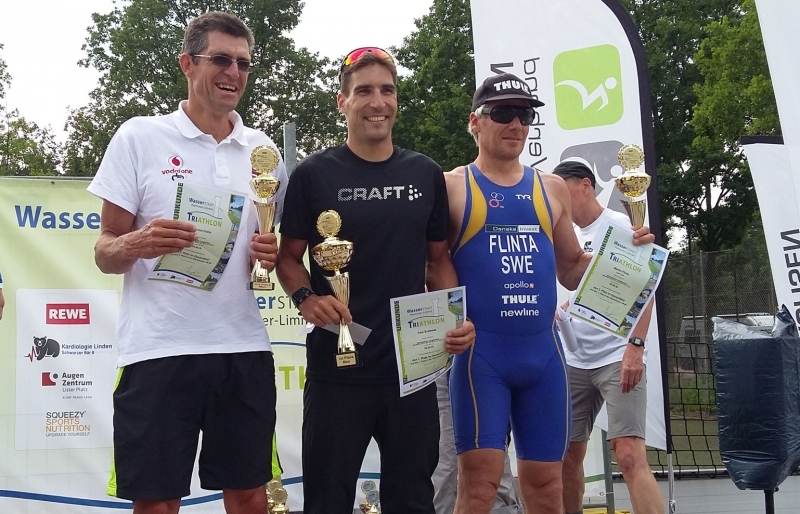 The strong performance of Möller was unfortunately not rewarded, because in the last kilometer Flinta (2nd) and Csima (3rd) were able to overtake – pure drama. 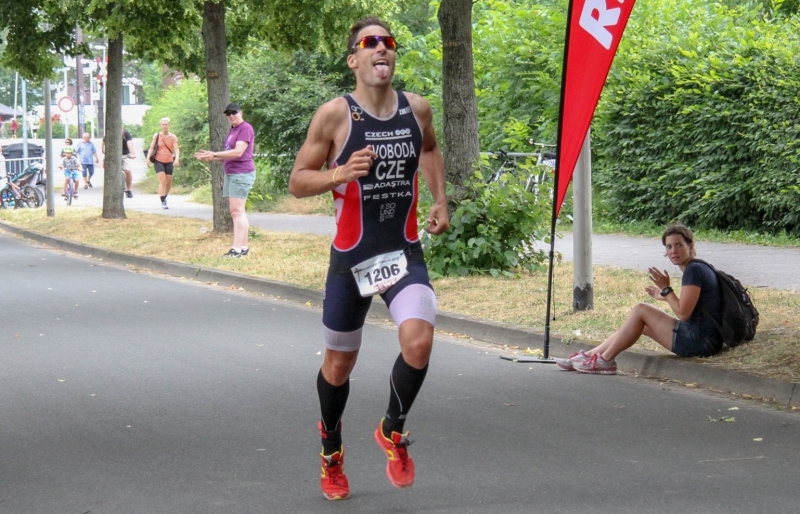 Even places 5 and 6 were only about 45 seconds apart, the long-distance world champion from last year in Kretinka (CZE), Roušavý, managed to overtake the multiple world champion Berg. Place 7 went to Teichert, who also finished in under 7 hours, a time that would have meant a place on the podium at all other World Championships – what a race. 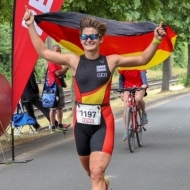 Amongst the women, Lisa Teichert’s (GER) target was to improve on her previous time and she did that with an enormous physical and mental performance. After just over seven and a half hours she ran through the finish with tears of joy – she had far exceeded her own high expectations. 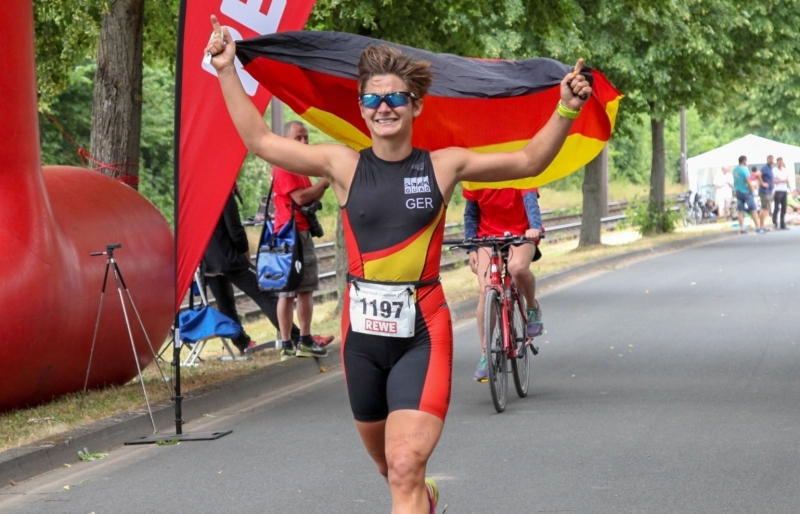 A small surprise was the performance of Susanne Walter (GER) in second place, who placed ahead of Gabi Menge (GER) thanks to consistently good performances. 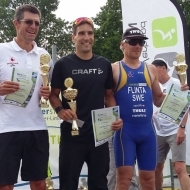 For Menge it was a Quadrathlon comeback after an 18 years gap. 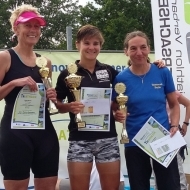 In 2000, she finished second at Quadrathlon Ultradistanz in La Coupière, France. In Hannover this year, there was also some past Olympic contenders. Tomáš Svoboda was once again accompanied by his twin brother David on the course – he was, amongst other performances, Olympic champion in the Modern Pentathlon in London, 2012. 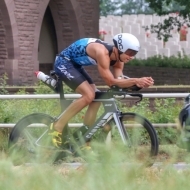 Another former Olympian, Christian Prochnow (triathlon in Beijing, 2008) took part in the relay race as a cyclist, showing that he is still fit. Overall, from amongst the relay teams there were many extremely strong performances produced. 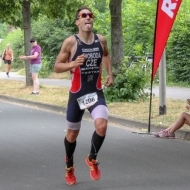 In addition to the long-distance race on the Sunday, there was also a sprint distance (0.75S-20R-5L-4.5K) the day before, as is usual Hannover. Both sprint and long-distance were part of the QUAD Germany Cup sponsored by Sports-Block.com. 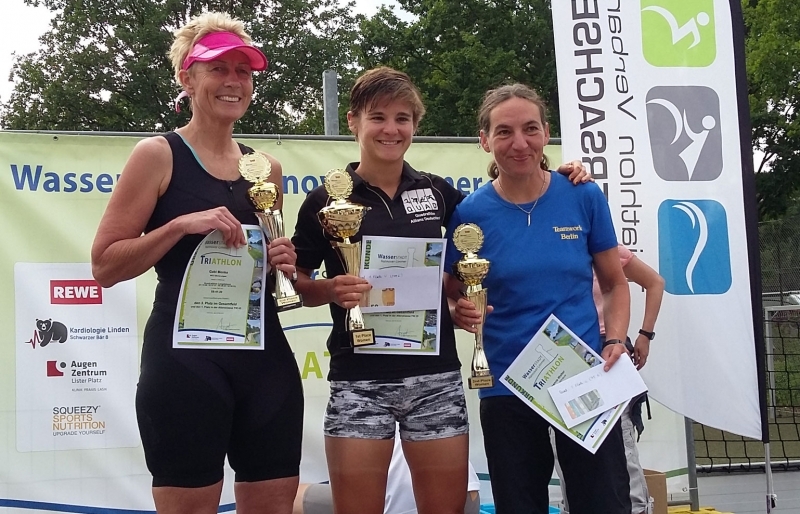 The outcomes in the sprint were very close and exciting for the spectators: For the women, Lisa Teichert “rolled in” the day before her main event and still secured the victory. 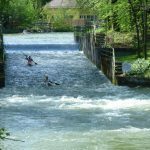 Anke Trilling, thanks mainly to her better kayak leg and a final sprint, ran in 5 seconds before Franziska Place Eberhardt. 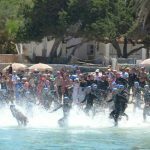 The men also sprinted for the win, in paddling Torsten Bartzok came closer and closer to Fredrik Tügel, but in the last few meters before the finish the Quadrathlon debutant Tügel had the faster legs. Third place went to Björn Friedrich who had led for the first two disciplines. 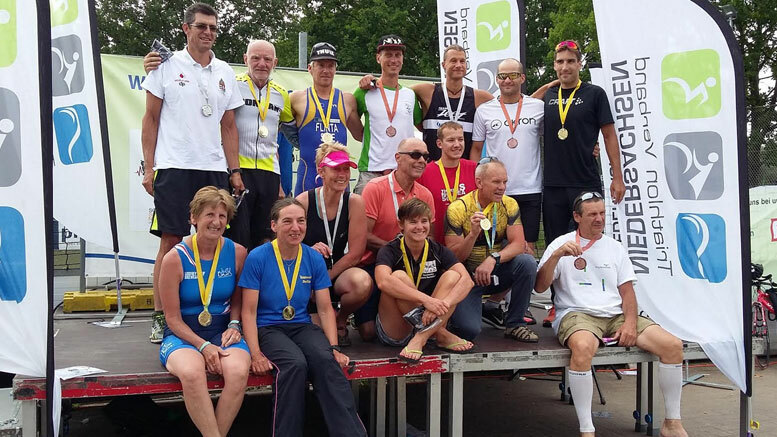 In its sixth year, the Quadrathlon in Hannover has established itself well on the scene thanks to the organization of Tomas Kälble. 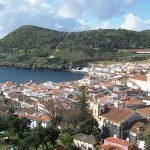 The event can build on the great base offered by the simultaneous triathlons taking place over the weekend. But since these have quite high entries, sometimes it is not easy for our smaller sport to stand out in this great multisport weekend. One would certainly wish for a different setting for the award ceremony, which gets more focus at other quadrathlon championships. On the other hand, there was attention to such small details as the finisher medals, for all athlets these also included a paddle symbol – not a matter of course for such a big triathlon event. Hannover will therefore be well worth a visit next year as well. Be the first to comment on "Great excitement in Hannover"